Lately, Google has released Google Chrome 6. Google Chrome 6 brings many new features such as that described in chrome.blogspot.com. Google is also celebrating the second anniversary of Google Chrome. 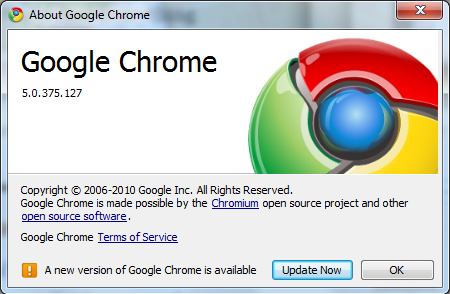 You can instantly update your own Google Chrome right now. Google Chrome will bring you surfing in the virtual world faster, simpler, and safer in the three platforms (Windows, Mac, and Linux). Google Chrome 6 brings new features such as: New Tab page is more tailored, browser theme, side-by-side view, a password manager, a better privacy controls, a built-in Adobe Flash Player, Autofill, automatic translation, the ability of HTML5 and synchronization of various settings such as bookmarks, themes, extensions and preferences of the browser-just to name a few. Currently 6000 extensions are available in the Google Chrome gallery. Here is my technique for updating Google Chrome 5 to Google Chrome 6 I have been doing. First, I opened the screwdriver icon in the upper right corner, then I open About Google Chrome, so that Google Chrome search their own updates. 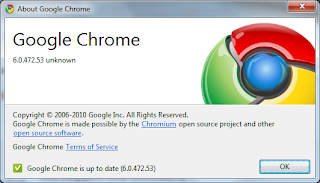 You can also download Google Chrome 6 here.